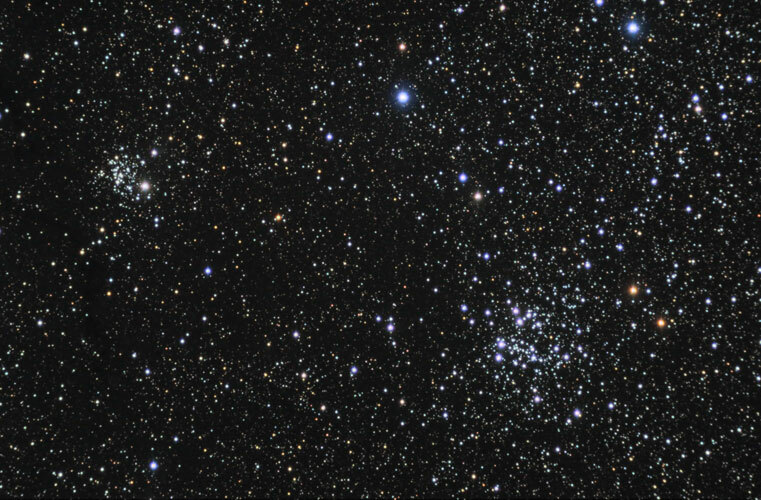 These bright open clusters are an attractive pair in a wide-field instrument. Technical Notes: Individual exposures were taken using CCDAutoPilot2 and then sigma combined. The RGB image was created in Registar 1.0. A Gaussian Blur of 0.5 pixel was applied to the RGB image and to the dim portions of the luminance and RGB images. Unsharp Mask of 1 pixel with a Threshold of 1 was applied to the bright portions of the luminance image at 50%. The RGB image was duplicated and then combined with the original using Soft Light to enhance color.